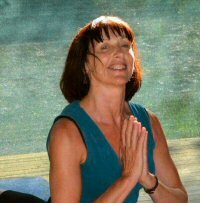 Jill is a qualified beauty, massage therapist and counsellor and is now a full time Yoga teacher She has experience in teaching several styles of yoga but most enjoys teaching Hatha yoga flow. The practice is very versatile and can be adapted to suit all ages and abilities. The practice of yoga asanas (postures) strengthens and tones muscles, develops flexibility, and can improve a variety of ailments. Psychologically yoga increases concentration, stills the mind and promotes wellbeing, tranquillity and contentment. Yoga is about learning to come back to yourself. It's about expanding your boundaries, finding your limits and being able to truly relax and be yourself. It's about taking time to remember who you are but have forgotten while being caught up in the whirlwind of a fast paced life. Hi JillI, thank you so much for the fantastic week we spent with you, it was lovely to meet you both. I gained so much from the yoga both physically and emotionally and I have felt much better since.I also really appreciated how you set the tone for such friendliness amongst the group and for us to all to participate at our own level. Since being back I have continued with the stretches that I found most beneficial and will now endeavour to find a local class.I also regularly hear your voice asking 'where are your shoulders now?' They seem very happy up by my ears and so I am working on my posture too!